Showering is the only time of the day when you actually have some “me” time, so, it has to be special. However, if your handheld shower head isn’t good enough, your only time for self-indulgence is going to be completely ruined. Therefore, a great handheld shower head is everybody’s need. The below-mentioned list of the best handheld shower heads will help you find that great one, which is going to make your bath time extraordinary. Take a look. The Ana Bath SS5450CBN is hands down the best shower head if you have a penchant for versatility. This 2-way shower head with 5 different functions will make your showering experience totally out of this world. The Hydroluxe ultra-luxury 2 in 1 shower head is an ideal choice for you if you want the functionality of the best showerhead without putting a burden on your pocket. The twin shower heads come with 24 flow patterns and 5 full settings, resulting in making your shower time worthwhile. The Delta Faucet ﻿﻿75700 should make its place to your showering area if you are seeking a low-maintenance shower head at a reasonable price. The plastic head with anti-clog holes is as easy to clean as can be. And the multiple spray settings ensure you get an awesome showering experience every time. The Waterpik SM-﻿653CG is a highly recommended shower head for those of you who want some monstrous pressure with soothing massage functionality. With its OptiFlow technology and the original shower massage setting, shower time is definitely going to be your favorite time of the day. If you are looking for a shower head with an exceptionally flexible hose and good water flow then go for the Delta 58467 In2nition. The unit comes with various spray settings and a removable sprayer, making it ideal to be used for bathing children and pets. Our top rank goes to the Ana Bath SS5450CBN for being the right assortment of performance, functionality, and affordability. The Ana Bath SS5450CBN comes as a 2-way product i.e. handheld and wall mount. Unlike the majority of the showerheads out there, this one offers a pretty wide shower head of 5 inches with a generous water flow of 2.31 GPM for providing you the extra coverage that others miss. The 5 feet long stainless steel hose is highly flexible to cater to all your showering requirements. This wonderful showerhead is not prone to leakage or poor flow at all, so you are definitely going to get a spa-like experience in your own bathroom. How cool is that? This versatile shower head, with its 5 different functions, gives you the liberty to switch to any of them as per your need. The different functions include massage spray, saturating spray, bubbling spray, massage saturating mix, and bubbling saturating mix. So, you see! This awesome shower head didn’t make it to the top just out of nowhere. In addition to these advanced functions, you can also divert the water three different ways that include diverting from the handheld shower, still shower head, or from both of these at the same time. The shower head, along with all the other parts, has a brushed nickel finish that is done through electroplating to ensure it stays. Even the shower hose is also covered in this very finish to prevent any kind of corrosion or rust problems. Lastly, the manufacturer has made use of some seriously high-quality construction material and fittings for the whole set to last for years to come. Our next contender is the one with very high customer rating and satisfaction rate because it is just that good. 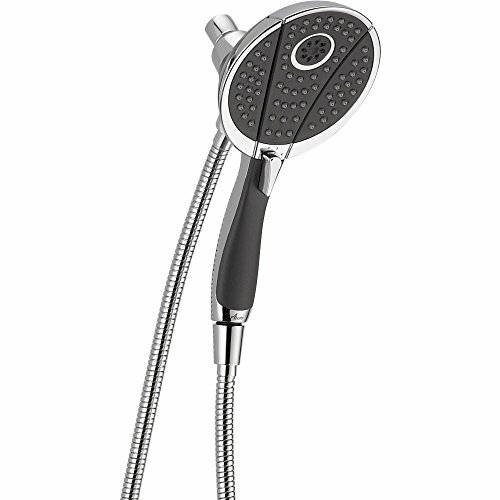 The Hydroluxe ultra-luxury shower head is again a 2-way shower head that can be used as both a handheld shower head and a wall mounted one. So, if you can’t decide between one, you can simply go for this one. 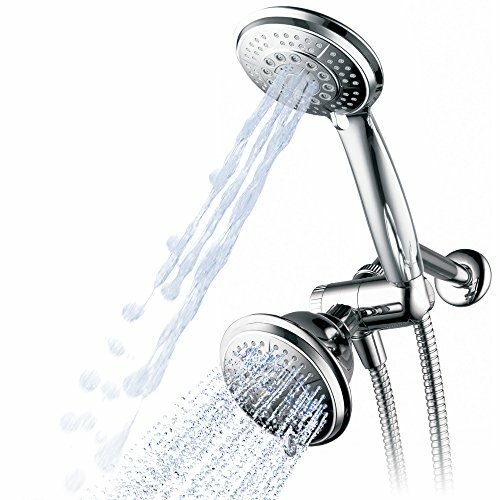 This shower head will also grab lots of your attention due to its highly inexpensive price. The Hydroluxe showerhead set is made of high-quality ABS plastic, chrome, and silicone, making it an adequately durable product for its price. Like the Ana Bath above, you can use both the heads together or you can use each one independently, all up to you. The width of both heads is 4”, which is enough to provide ample coverage to just about anyone. 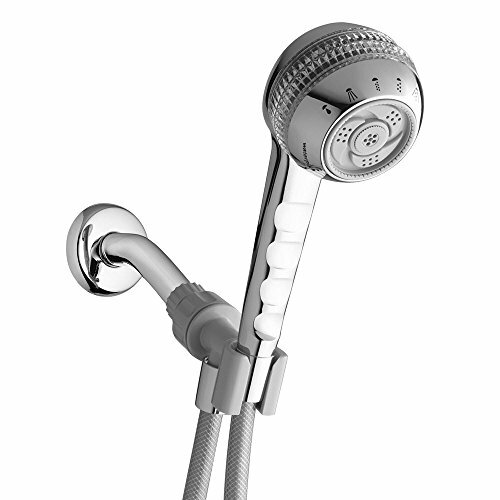 The Hydrouluxe ultra-luxury provides 24 different functions for both of its shower heads. Yes, 24! So, you can switch between any of those water flow patterns to enjoy your showering time to the fullest. You will also love the 5 full settings that are available for both the shower heads, which include power rain, water saving rain, massage spray, stay warm mist, and pause. All of these settings can be controlled through the 3-way water diverter. The shower heads also come with a massive 10 years limited warranty by the manufacturer, which is enough to encourage you to try it out. With all of its awesome features and functions, this shower head is undoubtedly great at what it does and surely deserves to be tried out. The next best shower head is the Delta Faucet 75700 which is pretty popular for its trendy design and various interesting functions. This one is again a pretty affordable option for those of you who do not want to spend a lot but are looking for some great value. Out of all the other shower heads from our list, this one comes with the biggest waterhose with 6 feet length. The waterhose isn’t just long; it is also pretty flexible as well. The complete package includes the hose, shower arm mount, and the shower handle. The shower head is made of soft rubbery plastic that is extremely easy to clean. You just need to wipe it off from your hand or finger and voila! It will be as clean as brand new. The holes in the shower head are also anti-clog, so cleaning them is also a doddle. The design of the shower arm has an ergonomic touch to it, which results in providing a very comfortable hold. You also have the liberty to use it as a wall mounted fixed shower for keeping your hands free. This shower head comes with multiple flow settings to choose from that include full spray, fast spray drenching spray, full massage spray, soft drench with full spray and a soft rain spray. You can easily switch to any of the settings by just turning the settings knob. The shower head also features a pause option which not only saves water from getting wasted but also gives you the freedom to enjoy your other activities like shaving and lathering without any rush. Waterpik is a well known and celebrated name when it comes to water-related tools, especially the ones related to oral hygiene. But, it turns out; the manufacturer is equally awesome with the shower heads. This is the reason, the Waterpik SM-653CG made it to our list of the best handheld shower heads. This shower head is an excellent choice for relaxing after a tiring and long day at work. Nothing can provide you the sort of relief you get from a comforting massage shower that is only possible with the Waterpik SM-653CG. In addition to the celebrated original shower massage setting by Waterpik, this shower head comes with 6 different spray functions in total. So, you can mold your showering experience according to your requirements. The width of the shower head is 3 inches and it comes with the OptiFlow technology, which ensures that you get excellent performance and superb water flow. This shower head is available in two different types based on the water flow. One of them is for the 2.5 GPM and the other one for the 2 GPMflow, so you can pick whichever you like. But, one thing is for sure, whichever you pick, you are going to get the maximum water flow possible. The 5 feet shower hose is flexible enough to help you with bathing your pets and kids without any problem. It also comes with an adjustable bracket for mounting it to the wall. And on top of everything else, it comes with a lifetime warranty from the manufacturer, which is highly uncommon in the world of shower heads. So, this makes it definitely worth considering and trying. 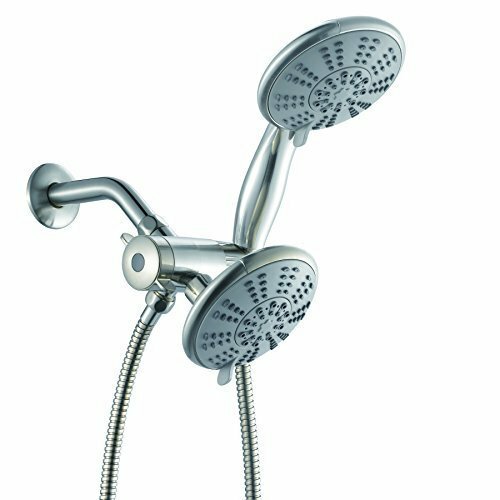 Lastly, we have got the Delta 58467 In2nition, which is again a combo or 2 in 1 unit that you can use both separately or with the shower head. This 2-way functionality gives you the freedom to use it the way you want for having an outstanding experience. This shower head also comes with a pause feature that adds to the flexibility of its usage. You can put it on a pause while you are shaving, shampooing, lathering, or while carrying out any other such task. And when you turn it back on, you get the same water temperature as before. The pause setting, in addition to providing you flexibility, also helps in preserving water. Hence, you can say that it’s an environmental-friendly shower head. Like the majority of the shower heads on our list, this one also features 5 feet long hose which is quite flexible. The shower head comes with different spray settings that have varying pressures, so you can choose one accordingly. The Settings include full spray, massage spray, and fast massage spray. All of these settings give you a unique and pleasant showering experience. This shower head unit is perfect for both your personal use or for showering your children or pets. The construction material of the shower head unit is comprised of plastic with two different finishes to choose from, which include brilliance stainless or chrome. One thing that every handheld shower head user can vouch for is its high flexibility. With the wall mounting option, the shower head gives you the freedom to use it the way you like it. Also, the hose is generally long and flexible which adds to the convenience for cleaning other things as well. The majority of these handheld shower heads come with the massage feature, which feels like a boon when you get into the shower after an exhausting day. Even on the daily basis, you have all the right to pamper yourself with a shower massage to feel relaxed and fresh. The massage setting doesn’t only feel good; it also helps in relieving the symptoms of a backache or sore muscles. It also helps you in kick starting your day when you are too sleepy to function. Being so strong, it might not be ideal for everyone, but you can always adjust the pressure as per your likeness. Most of them also come with a drench spray option, which gives you a very heavy water flow. It is especially ideal for you if you have very thick hair as the light flow will not able to penetrate all the way through your hair. The handheld shower head can be used for cleaning your tub without using any other tools. All you have to do is to increase the pressure and that’s it. The handheld shower head, with 2-way settings, makes you feel as if you are taking a shower in a spa. You can have the rain spray, the massage spray, or various other settings to enjoy it to the fullest. A handheld shower head makes it extremely easy to bathe your children or pets. The flexible hose with water flow settings let you wash your children or pets’ hair effortlessly. 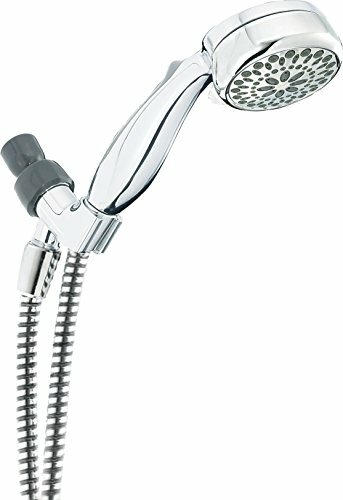 What to Look for in a Best Handheld Shower Head? For some people, a big head works, while for the others, the smaller the better. However, if the head is too big, it would be a bit of a nuisance to handle it. So, make sure the head is of the right size. Generally, 3 to 5 inches wide heads work for just about anyone. Although a bigger hose length is considered good in handheld shower heads, it would be absurd to get very long hose if your showering area isn’t big enough. Just make sure the length is enough for a comfortable wash.
Make sure to go for good construction quality and renowned brands. Check for customer ratings online. A good showering experience depends on a lot of things. But, the most essential of them all is the flexibility of your handheld shower head. No one enjoys short or tangled hoses with inadequate water flow or leaked spots. But, as you saw above, you can prevent all of this from happening by investing in a good quality handheld shower head. You don’t necessarily have to go overboard for getting an awesome experience. You can get an excellent quality handheld shower head for as low as $25. So, if you haven’t upgraded to a good shower head yet, it’s about time you did it.